Depth adjuster bolts (1) allow adjustment of individual gangs up or down within a 140-mm (5.5-in.) range. A Level-lift™ linkage with easy turnbuckle leveling enables the mulch tiller to remain level whether in transport or in the field position. A hitch jack is included with all models for storage and easier hookup to the tractor. 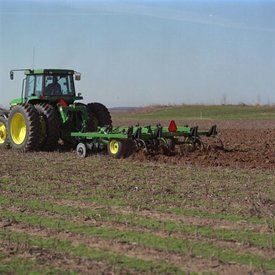 Coulter blades are for use where little incorporation is desired or for erosion-prone areas where it is important to disturb as little residue as possible. Blades are on 229-mm (9-in.) spacing to reduce the chance of plugging. Two-position blade down-pressure adjustment ensures consistent blade down pressure in light- or heavy-residue conditions. 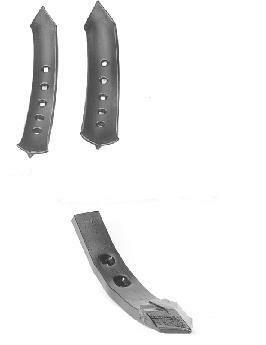 Coulter gangs have rigid scraper bars. Dura-Flex™ bearings and welded steel spools provide reliable performance and durability. Gangs are spring-cushioned with 140 mm (5.5 in.) of vertical travel to provide protection against rocks or other obstructions. 76-mm x 610-mm (3-in. x 24-in.) concave twisted shovels for use in a wide range of average soil conditions are base equipment. 102-mm x 610-mm (4-in. x 24-in.) concave twisted shovels for use in light, sandy soils or where greater fracturing between the standards is desired, are optional equipment. 51-mm x 305-mm (2-in. x 12-in.) chrome carbide point chisel provides excellent strength and wear life in tough-to-penetrate conditions. Typical percents of residue cover remaining are listed in the table. The percentages do not take into account variables such as the condition of the residue, speed and soil type.